Aircraft carriers are the cornerstone of America's naval capabilities. They're able to project air power anywhere in the world without having to depend on local bases. And they are truly massive. Spanning 1,092 feet long — three times the length of a football field — Nimitz-class warships like the USS George H.W. Bush are the largest aircraft carriers. The USS Nimitz conducts an aerial demonstration. 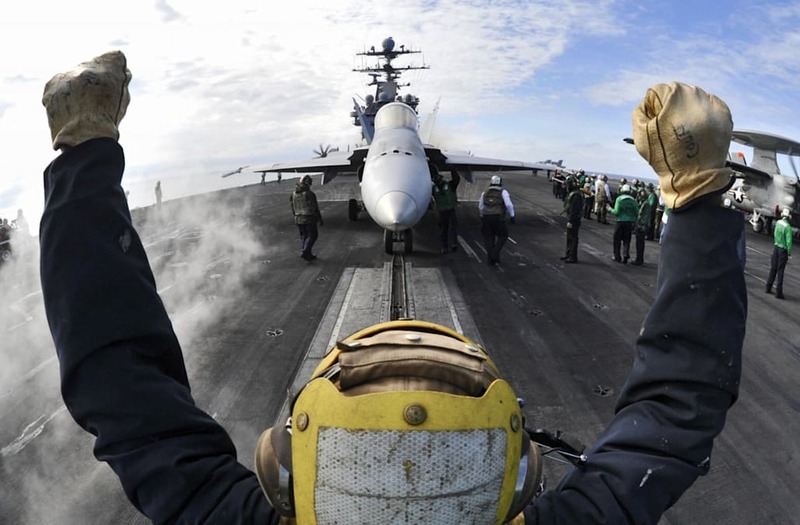 An aircraft director guides an F/A-18C Hornet onto a catapult aboard the USS Harry S. Truman. The Nimitz-class aircraft carrier USS Carl Vinson (CVN-70) transits the Strait of Hormuz. Sailors scrub down the flight deck of the USS George Washington (CVN-73). Sailors man the rails of the Nimitz-class aircraft carrier USS Ronald Reagan (CVN-76) while departing Naval Base Coronado. The USS George H.W. Bush is underway. PCU Gerald R. Ford is floated for the first time. Blue Angels fly over the USS George H.W. Bush in the Atlantic Ocean. The USS John C. Stennis conducts flight operations. Sailors man the rails as the USS Nimitz (CVN-68) enters Pearl Harbor. The USS Carl Vinson is underway in the Persian Gulf. Sailors observe as the USS John C. Stennis sails alongside the USS Ronald Reagan. The USS George Washington (CVN-73) leads the George Washington Carrier Strike Group. The USS Ronald Reagan transports sailors' vehicles. The Nimitz-class aircraft carrier USS Carl Vinson (CVN-70) departs San Francisco. The USS Harry S. Truman (CVN-75) performs a full-power run-and-rudder swing check during sea trials. Photo Credit: USS Harry S. Truman performs swing checks. F/A-18 Hornets demonstrate air power over the USS John C. Stennis (CVN-74). The USS Carl Vinson (CVN-70) transiting the Strait of Hormuz. The USS Enterprise is underway with the Enterprise Carrier Strike Group in the Atlantic Ocean. The Nimitz-class aircraft carrier USS John C. Stennis (CVN-74) returns to Joint Base Pearl Harbor-Hickam. The USS Abraham Lincoln and USS John C. Stennis join for a turnover of responsibility in the Arabian Sea.